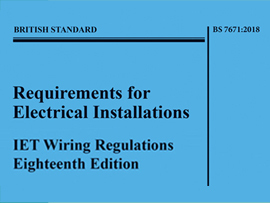 The City and Guilds 2382-18 '18th Edition' electrical qualification replaces the former 2382-15 '17th Edition'. Available as either a 3 or 5 day course for experienced or inexperienced/non electricians who don't hold a previous qualification it can also be taken as a 1 / 2 day Upgrade course for people already holding the 17th Edition (see separate course entry). For inexperienced or non electricians the 18th Edition can be taken as a 5 day course. To achieve the 18th Edition, City and Guilds 2382-18 qualification. Teaching will be by means of presentations and discussion sessions combined with worked examples. At the end of the course candidates will be required to complete one multiple choice, online test (120 minutes).